During a recent trip through Southern Spain, my wife Shelley and I spent a few days in the city of Jerez, not far from the Strait of Gibraltar that separates Spain in Europe from Morocco in Africa. We also learned about a ferry service from Tarifa in Spain to Tangiers in Morocco, suitable for a day-trip. Thus, one early morning we caught a ferry from the port of Tarifa. Once on board, the coastline of Morocco, across the Strait of Gibraltar came to our view. 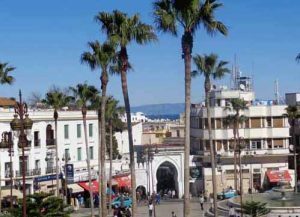 Being near the juncture of both the Atlantic Ocean and the Mediterranean Sea, Tangiers played a historic role throughout centuries in international affairs, while retaining its own charm and mysticism. On arrival, we headed towards the old town of Medina. A section of the old town square still houses the historic hotels and cafes along with a majestic old gate. 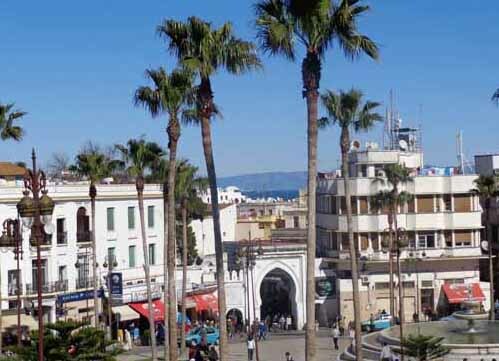 Our main interest in visiting Tangiers was to explore its still functioning historic market. An old narrow path, congested with people as well as cars, led us to the market area of the old city Medina. Different sections of the market were designed for different trades, thus creating an atmosphere filled with various shades of color and different senses of aroma. Walking on byzantine narrow alleys, we arrived at the vegetable section of the market. In stall after stall, fresh, differently colored vegetables were displayed in such a coordinated manner that the arrangement appeared more like an artist’s palette. 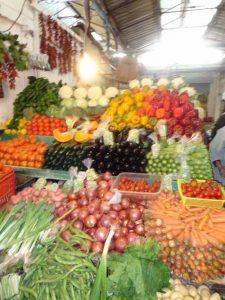 The next section of the market offered the view of different shaped- and colored- olives, a main staples in the cuisine of the local citizen. Being close to both the Atlantic Ocean and the Mediterranean Sea, a section of the market showcases plethora of fresh sea-foods. A walk through this section allowed us to observe previously unseen (by us) local delicacies. Finding our way through another maze of narrow streets that housed the spice shops selling multitudes of variously colored spices with their aroma permeating the atmosphere, we arrived at a market café for our lunch. We tasted the local favorite tajine (a soup made of mutton, prunes and almonds) and couscous along with a glass of mint tea. From there, we approached a historic landmark of this old city. In December of 1777, Morocco was the first country in the world to recognize then newly-established government of the US. The renovated original consulate building, in the heart of Medina, now houses a museum known as the Tangiers American Legation Museum exhibiting a large collection of historical documents. This is the only historic landmark of the US outside its own border (Image 6). Unfortunately, it closed its door for the day before our arrival, thus denying us to view its collection of the historic artifacts. Next, we explored the historic protective wall of the old city. A restored painted section offered a look into the past art and architecture of the country. From the outer terrace of the wall, a panoramic view of the port also came to our view, this time the continent of Europe being in the horizon. We ended our exploration of Medina to take the ferry back to Tarifa. But the color, smell friendliness of the merchants of the market as well as the taste of the local food and drink enriched our experience of a foreign country and culture.